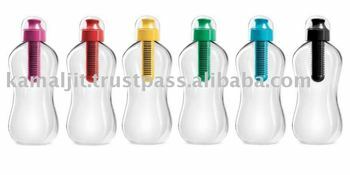 Bobble Bottle.The first Bottle containing its own water filter.Filter normal tap water and drink fresh prifided water on the go. Every year Americans spend $17 billion on bottles of water and most of these empty bottles end up in landfills. Water Bobble allows you to fulfill your desire for water sustainably - this revolutionary product promises to care both for you and for our planet. The bottle is made from recycled Plastic and is re-usable. This unique water bottle features a carbon filter which removes chlorine and other contaminants from tap water - offering cleaner and noticeably better tasting water. The filter lasts for up to 150 litres of water or up to two months. The filter is also recyclable - ensuring a better planet for all and can be replaced. Available in a wide range of colours from Design 55. Volume: 550ml. Both affordable and stylish, this is a product no home should be without! Bobble is a patented filtered water bottle for life on the move. Just fill it with water and bobble will do the rest: hydrate, be beautiful and reduce waste, one sip at a time. Washing instructions: Bobble should be hand-washed regularly, regular washing limits bacteria growth. *Bobble is not dishwasher safe. * Please wash Bobble thoroughly in hot soapy water and soak the filter in it's plastic cover in boiling water. Contact Us for Recent Prices.